"A person without a sense of humor is like a wagon without springs - jolted by every pebble in the road." 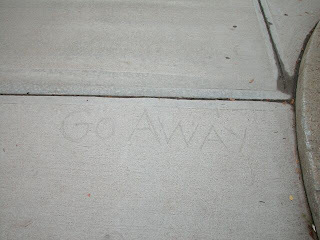 Spouse and I stepped this morning across some graffiti scrawled faintly onto the footpath in Cambridge. The statement was simple and blunt: 'GO AWAY.' At first, being a tourist to the area, I was inclined to take offence. However, upon reflection and with hindsight, I choose to take it as a rather apt icon of my week thus far. I am away, thank you, and am enjoying it immensely. Everyone ought to Go Away. I highly recommend it. What an absolutely wonderful way to interpret what was probably written in a very different context. i feel like going away, too. funny how words can be interpreted in different ways, and i love your take. What an optimist you are...and always so insightful. Barb, thank you kindly- I have no idea what was meant by the phrase, but can only guess. So I turned it into something else. Polona, thank you! Almost everything, I think, can be interpreted in more than one way- that's why I love words. Jaime, I try to be optimistic ;) I had a wonderful week- I had no reason to complain about anything and it felt so good.